Knowing where power lines and other potential hazards are should be part of the planning process for any outdoor project involving ladders. Whether it is trimming trees, cleaning gutters, or repairing a roof, Safe Electricity provides tips to help all those using ladders to do so safely. 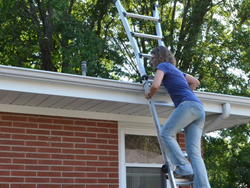 Whether trimming trees, cleaning gutters, or repairing a roof, be sure to use ladders safely. Always look up and look out for overhead power lines or equipment. Ladders are tools that allow homeowners and construction workers to climb up closer to important tasks that they need to work on, but they can also put people dangerously close to overhead power lines. Knowing where power lines and other potential hazards are should be part of the planning process for any outdoor project involving ladders. Whether it is trimming trees, cleaning gutters, or repairing a roof, Safe Electricity provides tips to help all those using ladders to do so safely. “Knowing what is overhead and what is over your head could save your life,” says Molly Hall, executive director of the Energy Education Council and its Safe Electricity program. According to the Occupational Safety & Health Administration, of the more than 4,000 worker fatalities in private industry in 2014, one in five worker deaths were in construction. The top causes of these tragedies are called the “Fatal Four,” which are falls, electrocutions, struck by object, and caught-in/between. When working with ladders, falling is the top safety concern, and contact with overhead power lines presents the second highest risk. In August 2016, the Dayton Daily News in Ohio reported on an incident in which two people replacing a roof on a church each received a serious electrical shock while in the process of relocating a ladder. Also in August, NBC 2 out of Fort Myers, Fla. reported that a 20-year-old man lost his life when he and a co-worker accidentally leaned their ladder against overhead power lines. Keep yourself and ladders far away—at least 10 feet in all directions, at all times—from power lines, including service lines. Make sure that the area above the ladder is clear before placing it upright. Long ladders may be unwieldy, so ask for help in carrying and setting them up. Always make sure that the ladder is on a solid, level surface before attempting to climb. Inspect the ladder before and after use to make sure that there is no damage that could put users in danger. For more safety information, visit SafeElectricity.org.